Anytime you mix together cheese and potatoes – you’re going to get magic, right? Right. 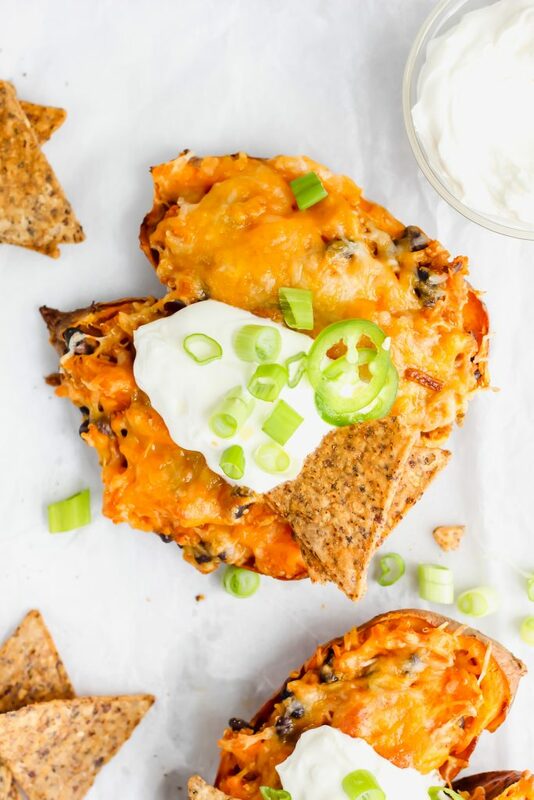 How about cheese, luscious black beans, fluffy quinoa, slightly spicy enchilada sauce AND sweet potatoes? Tastebud overload, I know. Okay, so you know that dish that they always have at Mexican restaurants? It’s an enchilada sampler. It always has like, 5 different varieties of enchiladas on it – cheese, bean, chicken, beef, steak. Or something like that. That dish is WAY underrated! Move over fajitas! Who doesn’t love that delicious twangy sauce and the cheese and the beans and all the flavors that infuse together?! Brb, going to get Mexican food now. JK. Guys, you can have something like this AT HOME. FOR WAY CHEAPER. (For anyone who knows me, I’m all about the budget.) And best news? You probably already have the ingredients in your pantry! Also – PRO TIP. 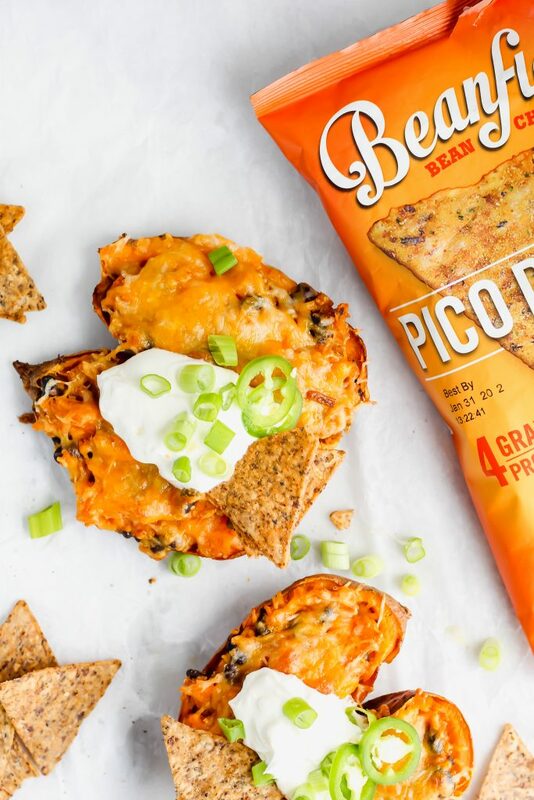 Skip the fork and use Beanfields chips instead! Seriously y’all these are SO good. Flavorful and full of fiber. And I love them. You really just need a few basic things and the rest you can improvise! Only 5 essential ingredients?! Say what? You heard correctly. And to be honest, this dish really seemed to take a short amount of time to make. Let’s get into it! Start by pre-heating the oven to 425. Poke some holes in your sweet potatoes, rub a little bit of olive oil on the sweet potatoes and then wrap them in foil! Place them in the oven and let them back for about one hour or until they’re fork tender. While the sweet potatoes are cooking, go ahead and cook up your quinoa and warm up your black beans. Set them aside. Once the sweet potatoes are done, let them cool and scoop the orange goodness into a bowl. Do this very carefully because you don’t want to tear the skin! 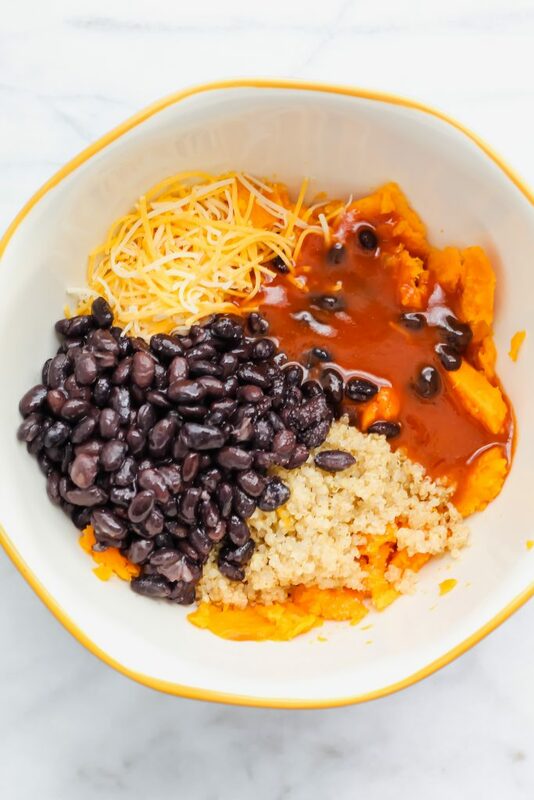 To this bowl, add in your quinoa, black beans, cheese and enchilada sauce along with spices like garlic, salt and pepper! Mix and taste to adjust seasoning if needed. 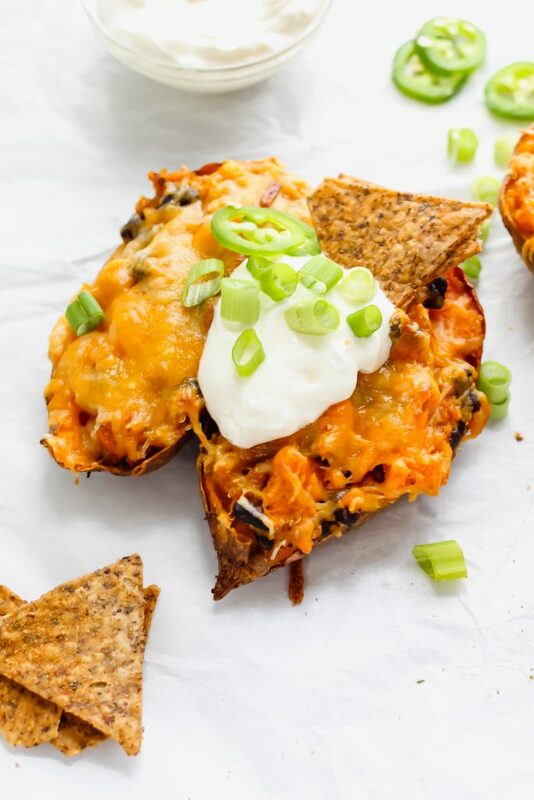 To the empty sweet potato skins, stuff the quinoa/cheese/bean mixture BACK into them. Top them with more cheese (because cheese is life) and into the oven they go for another quick 10 minutes until the cheese is extra bubbly and golden brown. For the toppings, I used things I had in my fridge! I used sour cream (aka the love of my life), green onions and jalapenos. I think some fresh avocado and cilantro would go well on it also. Oh, and I had a side of chips and salsa. And by side I think I ate half the bag. Pro tip: use a chip as silverware instead of a fork. Life changer. 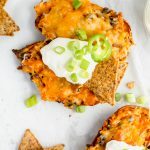 Note: To make the dish vegan, simply omit the cheese and of course, don’t top it with sour cream. Boom! Veganized + vegetarian. Enjoy and don’t forget to eat lots of chips and salsa! 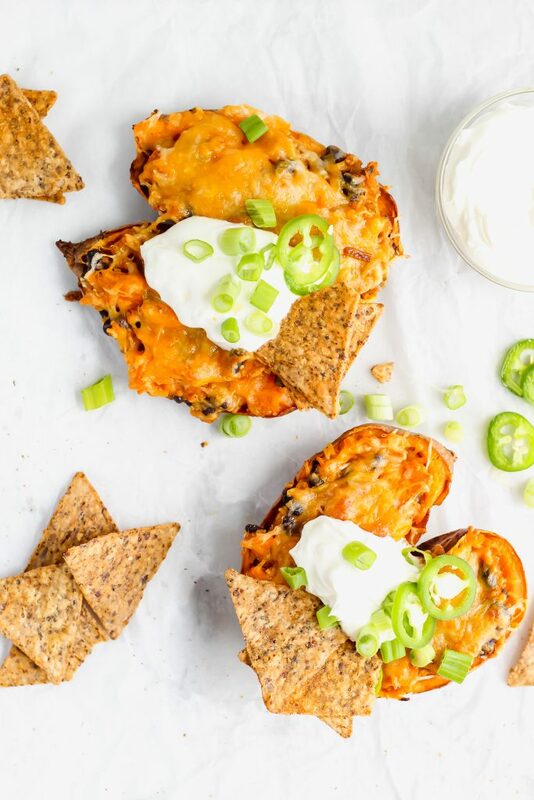 A stuffed sweet potato with a tangy enchilada sauce filled center of quinoa, black beans and you guessed it - cheese! Preheat oven to 425 degrees. Wrap sweet potatoes in foil and bake for 1 hour or until fork tender. While potatoes are baking, place 1/2 cup quinoa and 1 cup of broth (or water) in a pot. Bring to a boil. Note: I just happened to have broth in my fridge - water will work well! You may just want to add a little salt for some seasoning. Once quinoa is at a rolling boil, reduce the heat to low. Cover the pot and let simmer for about 15 minutes. Once the quinoa is done, let it sit for an additional 5 minutes. It should be light and fluffy! Set aside. Once the potatoes are fork tender, let them cool for a bit! Once mostly cool, scoop out the inside of the potato carefully (keep the skins intact) and place them in a bowl and mash them with a fork. Add in quinoa and black beans to the sweet potato mixture. Mix well. Add in the enchilada sauce and cheese! Mix well. Generously add salt and pepper to taste. 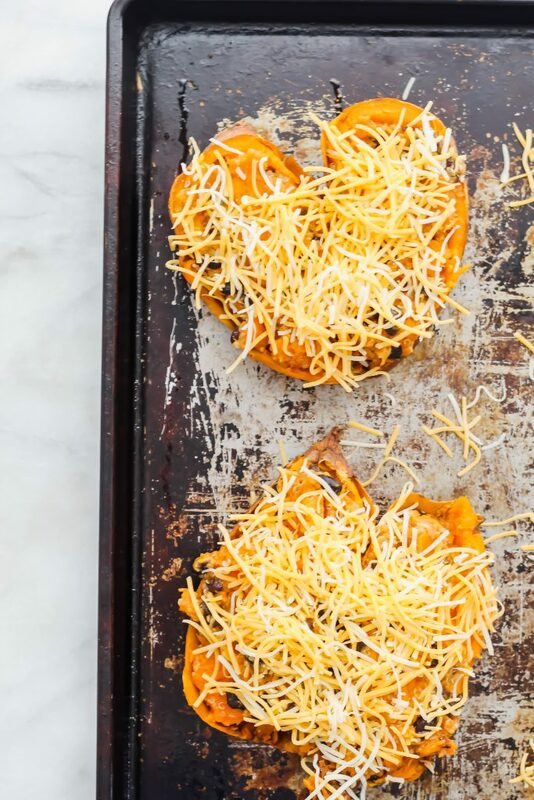 Once thoroughly mixed, fill the sweet potato skins back up with the mixture. Sprinkle with a little more cheese and bake for an additional 10 minutes at 425 degrees or until golden brown and bubbly. Top with stuff you have! I used green onions, sour cream and salsa. Other ideas: fresh avocado, cilantro, squeeze of lime. The world is your oyster! Cheese and potatoes definitely equals magic!! These are fantastic, Haylie! I bet even my boys would go nuts for them 🙂 We eat sweet potatoes a lot! Happy Friday!! What a clever idea. I grew up in Texas and have eaten my fare share of enchiladas but I never would have thought of this combination. Haylie, you have me drooling over these! The flavors are amazing. Love how you eat them with the Beanfield chips!